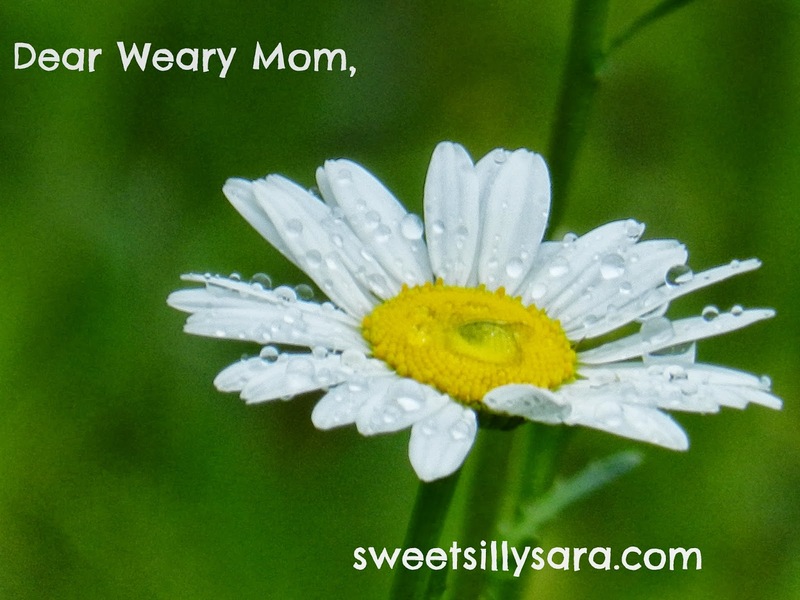 Today I am honored to share a guest post for the Dear Weary Mom series from my dear friend April from the Saving for My Family blog. So I have been sick for the last couple of days, I went to the doctor and got some meds and he told me to rest and take it easy except that is impossible as a mother. I would have loved to rest but someone has to make meals and clean the house. I just don't understand why when men are sick the world stops and nothing gets done and they get to rest all day and take it easy. Why is it we never get to rest or take it easy? Lately I have been trying to figure out a balance with blogging, housework, cooking, baking, participating in a clutter challenge, and spending time with the kids.I just can't seem to find enough time in a day to get everything done I want to get done. I lay up at night thinking about all of the stuff that I need to get done the next day. The kids are in school part of the day so that helps me get some of the house work done. I can't keep up with emails or think of topics to write for my blog. I also go to sleep and think about if I spent enough time with the kids, quality time. It is so hard to spend quality time there are so many distractions, TV, other things to get done, or they just keep changing their mind in what they want to play with. Plus there is always outside the home activities swimming and boy scouts. The days fly by and next thing you know it is bedtime. One thing I really enjoy is story time at night. Lately I have been having my son read me some of his books so he can practice reading. The best feeling in the world is when they come up and hug you and tell you that they love you out of the blue. It makes me realize on the days I think I am a bad mom that they think I am a great mom. Have you find a good balance for everyday life? Wouldn't it be nice to just rest and relax. It's a challenge for mom's. Just remember to take one day at a time. It's definitely a challenge finding balance and juggling the chaos but I always remind myself how fast they grow up, it seems like yesterday I was in the hospital with my tiny 3lb baby boy and in a blink of the eye he's almost 7! Remember that things will get better.